I left North America around mid-November in a snow squall for northern Italy across the water from Venice to a city called Mestre. In Mestre is an industrial yard called Fincantieri Navale which is the shipyard where every Holland America Line vessel for at least the last 18 years has been built. I’ve been a part of every build since 2010’s Nieuw Amsterdam but this year I was joining from the contractor side rather than the employee side of things. What I initially thought was going to be quite different turned out to not be very dissimilar at all - the real differences were not having to take part in the drills and not wearing a uniform. The things that were in common were the sudden changes in availability of hot water, elevators, power, trips out to the coffee machines. Having mentioned the coffee machines... some of the best coffee I’ve had has come from machines located outside in an industrial shipyard. Ridiculous! It never ceases to amaze me how a ship goes from massive pieces of metal to a floating hotel - at the risk of sounding like a Discovery Channel announcer, it’s really a marvel of modern engineering. Not a small endeavor in either time or man power, the end result after over a year is a ~99,000 ton ship. In the main theatre, the Worldstage, there is a 270 degree video wall which encompasses the majority of the space and a video ring which can fly in and out. Made up of somewhere around 15 million pixels, the wall is driven by two disguise media servers. 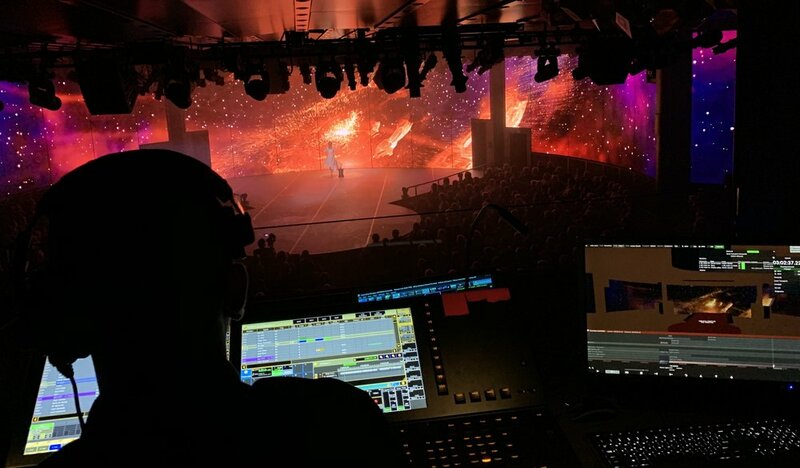 In addition to the LED surfaces there are also four laser projectors which put content onto the floor for the show Step One Dance Comapny presentation of Humanity. These projectors are fed by another three disguise servers from the control booth in the Worldstage. Despite the amount of technology that we put into the theatre it’s only a small percentage of the amazing tools (and toys) that get installed on this small city. Anyway, we were in the yard for a couple of weeks and then we sailed from Venice to Rome for the “shake down” or soft opening cruise and, following that, we left for a trans-Atlantic voyage to Fort Lauderdale. Quite a few days at sea but the ship was in pretty good shape with only a few minor bugs to work out and the crew was great. We hit land four or five days before Christmas and I flew from Fort Lauderdale to St. John’s Newfoundland to spend Christmas with the family - it was a pretty good time except for the fact that a bunch of us got sick; fortunately no one transmitted their illness to my niece. All in all, after having been away for 6 weeks I got home just before New Year to end off 2018 in Ottawa. This last week was my first week back out on a ship since I left for land life a couple of years ago. I wasn’t taking a pleasure cruise or anything; I was, in fact, out there for work to prepare for the Oprah Magazine Adventure of Your Life cruise on Holland America Line’s Nieuw Amsterdam. To the point, I really enjoyed being back out at sea. I knew that I would miss the camaraderie that I had with fellow crew members but I didn’t expect to miss the ship itself and being at sea. Don’t misunderstand me, there is certainly something uniquely attractive about being at sea but after having been at sea for the better part of two decades it wasn’t something I was anticipating would bring nostalgia. That being said, it was really nice to be out there for the week - I’m now back home in Ottawa and enjoying the crisp fall air before it turns into the biting chill of winter. It's fair to say that I've been to a lot of places and seen a lot of things; six continents, dozens of countries, and hundreds of cultural experiences. They say that the last places you ever really explore are the places you live, be it your city, your province (or state), or your country. This week I get to check off another province from my list and thus complete my tour of the Canadian provinces which leaves me with just two of the territories left: the Northwest Territories and Nunavut. Enough about the future though, this week I am in Newfoundland near St. Johns and while it's only been a few days it's been really picturesque and all around lovely. Earlier in the week I made it out to Quidi Vidi with my sister for brunch at Mallard Cottage where we split (family style) rhubarb French toast and a pork eggs benny before taking a walk around the area. We also took a day and wend out to Cape Spear which is the eastern-most point of North America excluding the Danish-controlled Greenland. 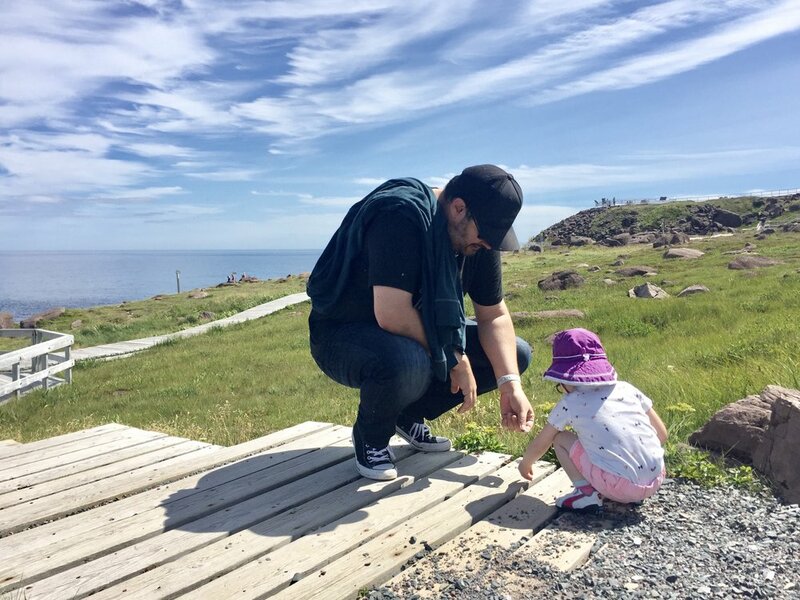 It's a pretty cool location as you can see from the first photograph in this post which depicts my niece and I on one of the boardwalks there. Throughout the week I'm planning on trying to make it out to a few other places that have been left on a must-see list for me before heading back to Ottawa. A friend shared this post on Facebook today and, though it's been over a year since I stepped off my last ship as a crew member, it still resonnated with me so here are some excerpts but if you can spare a 5 minute read I highly recommend swinging by Derek's Blog for this particular post.